Fight Off the Invasion of Slugs with An Organic Slug Treatment! When they start, slugs can be a pain to get rid of and a constant threat throughout the gardening season. They spend most of their day out of sight and then as soon as we draw the curtains, they very slowly, ‘charge’ towards our beloved crops and begin wreaking havoc. There are so many treatments to help in the fight against slugs and some very bizarre old wives’ tales. From slug pellets and copper tape, to beer traps and salt. Some of these slug treatments work, but most of them are either dangerous or ineffective. There is nothing more frustrating when trying to control slugs than spending money on a product, only to wake up and find havoc has been wrecked on your plants! 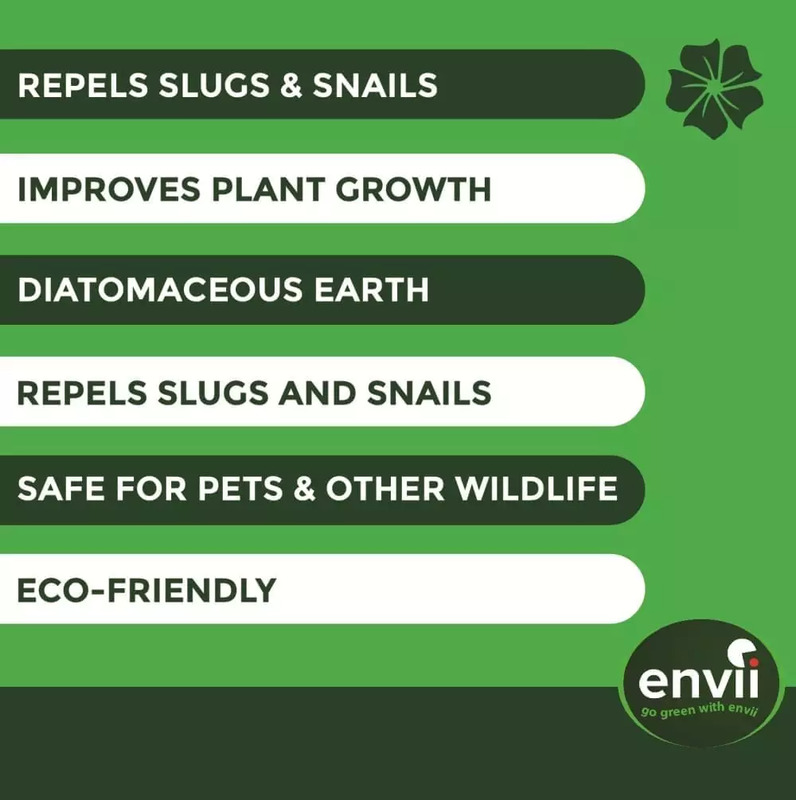 Feed & Fortify is an innovative slug treatment that offers several benefits compared to traditional methods. 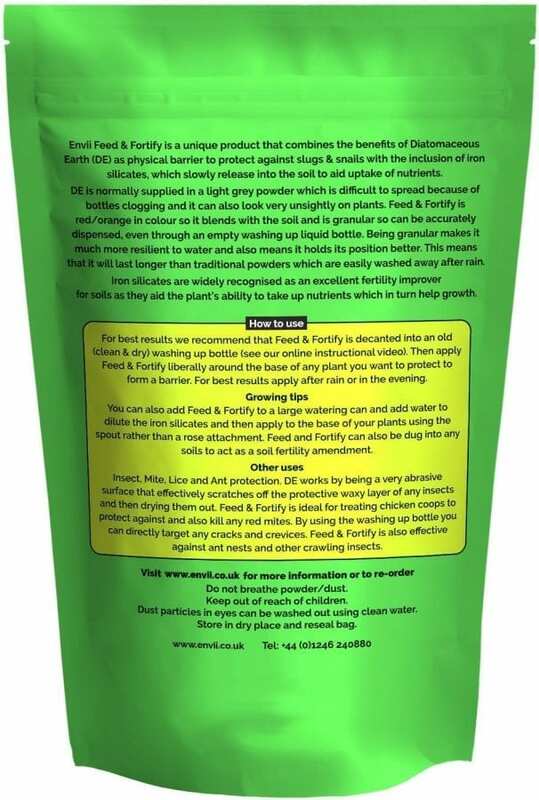 Made using diatomaceous earth, Feed & Fortify is a dual purpose, organic treatment that both protects and feeds your plants. The unique properties of diatomaceous earth allow it to create an impenetrable, physical barrier around your plants. The iron silicates improve soil fertility and increase a plants ability to take more nutrients on board. The other benefit of using an organic slug treatment is safety, and us brits, love health and safety! Slug pellets are the most commonly treatment used in the UK but can be incredibly dangerous to pets and children. It’s is important to use a repellent that doesn’t contain chemicals. 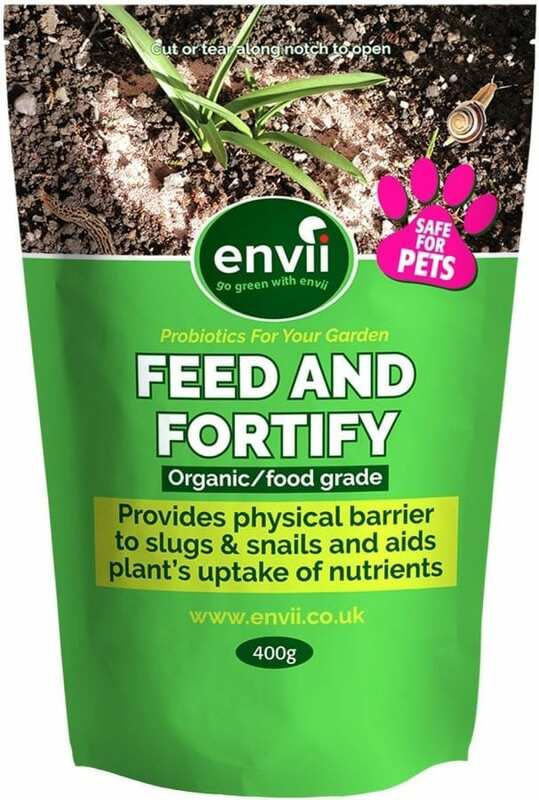 Feed & Fortify poses no danger, so you can have peace of mind whilst protecting your plants. Diatomaceous earth is made from the skeletal remains of tiny, fossilised aquatic organisms called diatoms, found within river beds. Diatoms have a hard-outer shell made from silica, it’s this that makes diatomaceous earth it’s unique slug control method. Silica is one of the hardest solids on earth and can be found in products such as glass and concrete. When used as in this treatment, its abrasive nature irritates the skin of molluscs and dehydrates them. Whilst Feed & Fortify poses no danger to children or pets. If inhaled, temporary irritation to the throat can occur, so please, keep out of the reach of children. If you want to protect your plants but also lives of slugs, check out Feed & Protect. This is our alternative to slug pellets that poses no danger to slugs. Learn how to protect your hostas from slugs. Use a clean, dry washing liquid bottle to apply Feed & fortify as accurately as possible. Watch the below video for more information. Will this be washed away in the rain? It won't be washed away in light rain but heavy rain may slowly wash it in to the ground. Is this safe to use around pets and children? Yes, Feed & Fortify is a natural product that poses no dangers to pets or children. Will it protect against other insects? Yes, it will dry and and desicate their waxy bodies. Natural artificial grass cleaner that eliminates the smell of dog urine from all kinds of artificial grass and prevents future smells by neutralising urine rather than sterilising or disinfecting like other cleaners.